As an adult Temujin (now played by Sharif) escapes with mute warrior Sengal (Woody Strode) and holy man Geen (Michael Hordern), infuriating the invariably seething Jamuga. Temujin is determined to unite the tribes of Mongol in order to conquer the rich kingdoms to the east and west. He quickly builds an army, and eventually kidnaps Jamuga's betrothed, Princess Bortei (Françoise Dorléac, her voice dubbed) and her three brothers, who become loyal lieutenants. But then there's the casting. One can forgive the lack of Asian faces insofar as Omar Sharif, Woody Strode, and Telly Savalas (lost in the crowd as a tribal leader) are concerned. They have malleable features that, like Yul Brynner, can fit a wide range of roles. But delicate French beauty Françoise Dorléac, freckly with alabaster skin and red hair, a Mongol? Blu-eyed Northern Irishman Stephen Boyd as a Merkit chieftain? 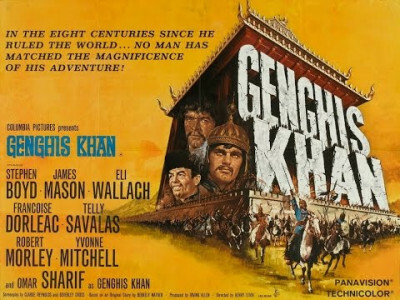 Brooklyn-accented Eli Wallach, the son of Polish Jews, as the Shah of Khwarezm?